We have a lot planned for you this month and in coming months. Don’t forget to checkout/subscribe to the calendar! Wow I can’t believe 2019 is already here and with it this will now be our 3rd year of PAH Tour. 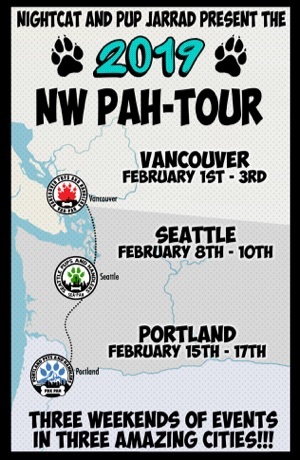 When Jarrad and I first came up with the idea for PAH Tour it was to help promote the bigger community that exists outside just the local PAH group in your own home town. Since then the PAH Tour has turned into a huge event of community support and a celebration of the entire NW community. What is PAH Tour you may be asking yourself? Well it’s a full month puppy event supporting each of our local communities. That’s right 3 cities and 3 moshes. This year we are bringing it to the month of February. Whether you are going to romp, socialize or just explore, come on out and have some fun! A mosh is an opportunity for pups and Handlers to get together and socialize. You’ll find pups romping around, playing with toys and having an all around blast while Handlers socialize and play with the puppies. *But good news for current VANPAH Members!….This skaties will be FREEEEEEEE!! Hey pupple! Come join us for our regular Board Games Night! One Stop Shop Cards and Games has a large library of games to play and try out. The shop is easy to get to from Stadium Skytrain station in International Village. We’ll be there from 7pm-9pm. Board Games Night will be planned for the 3rd Monday of the month so come on out and socialize!